The staff were great - attentive and friendly. We had a lovely suite that was more than we expected. 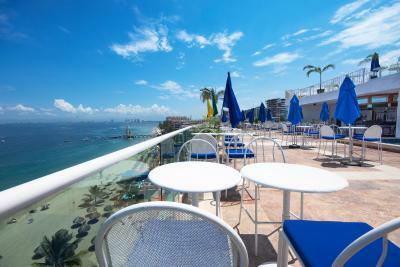 The view is spectacular, the beach bar is a lot of fun, as is the rooftop bar. There are some negative reviews on this place, but it appears they are trying very hard to fix the issues. I loved my view of the ocean and the large balcony. Only thing to like about this place is the location, right on the beach. Regardless the bad comments we decided to stay at Blue Chairs because of the location. The place is kind of falling apart so before we arrived we promised not to complaint and expect it was just a couple days by the beach in the gay area and next to Mantamar (Amazing beach Club) You have to go downstairs if you need something or call from your mobile phone. Wifi worked. The view (Beach front) and the price was excellent. 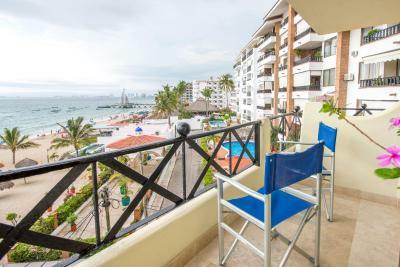 Location was great Room with sea view Nice rooftop bar with entertainment Cost/quality Room has fan and a/c If you have the chance, do the “ritmos de la noche” tour!! Location was great. We had an ocean facing room, and the view was gorgeus. We had an early check in. We appreciated that. I liked the fact it was near restaurants and beaches. My friend and I could walk around to places easily. Located on the beach! The original section has some rooms with terrific views over the ocean. A beach front patio restaurant serves breakfast. 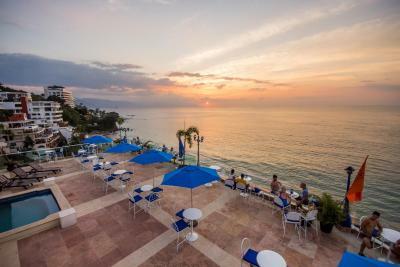 Blue Chairs Resort by the Sea, 6 miles from Puerto Vallarta International Airport, features a private beach and rooftop pool. 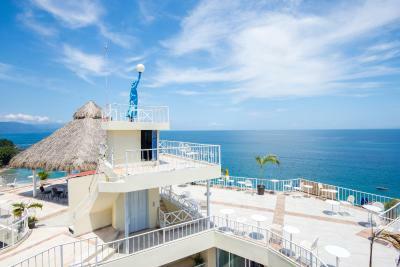 Rooms offer balconies with ocean views and flat-screen cable TVs. Guest rooms ceiling fans. 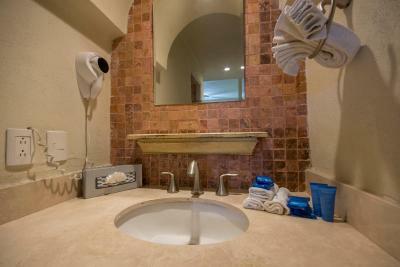 They also include coffee makers, bathroom amenities and hairdryers. 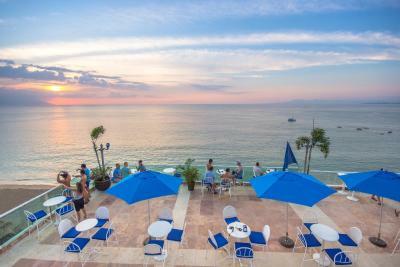 Guests at Blue Chairs Resort by the Sea are offered a restaurant and bar. 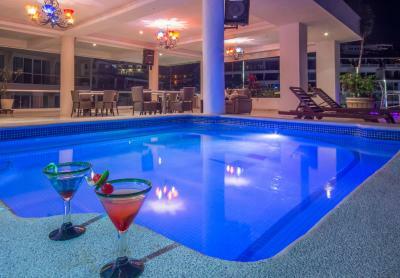 The hotel has a spa and provides room service and concierge service. 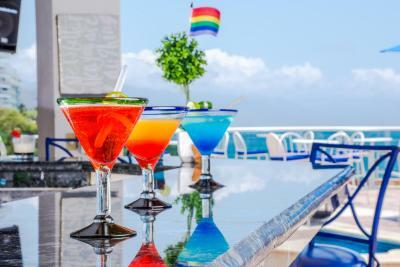 This gay and lesbian-friendly hotel is 5 miles from La Paloma Plaza de Toros. 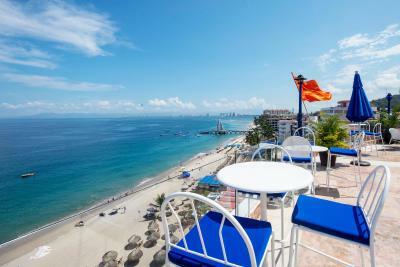 It is 6 miles from Marina Vallarta Golf Club and 7 miles from Canopy Tour El Eden. 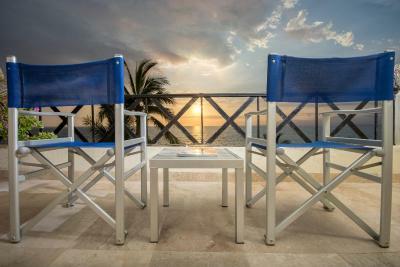 Blue Chairs Resort by the Sea has been welcoming Booking.com guests since 2 Dec 2010. When would you like to stay at Blue Chairs Resort by the Sea? This room offers a partial ocean view. This room offers a full ocean view. This is an oceanfront room. This suite features an ocean view and a kitchenette. This suite has a balcony, private entrance and satellite TV. House rules Blue Chairs Resort by the Sea takes special requests - add in the next step! Blue Chairs Resort by the Sea accepts these cards and reserves the right to temporarily hold an amount prior to arrival. 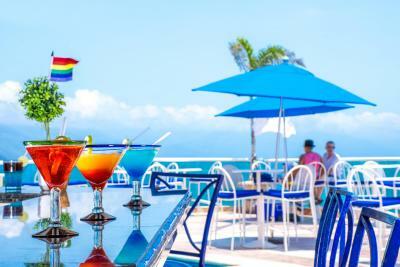 blue Chairs Resort by the Sea is a gay and lesbian-friendly hotel. The employees were very friendly. Specially at the restaurant. Location. Upon arrival had to change rooms 3 times ( in 1 day ) Some of the major issues were entry doors not locking no AC no TV overall cleanliness unacceptable no hot water several problems with the plumbing. The staff were very accommodating but my husband and I will never stay here again and will not recommend this hotel. 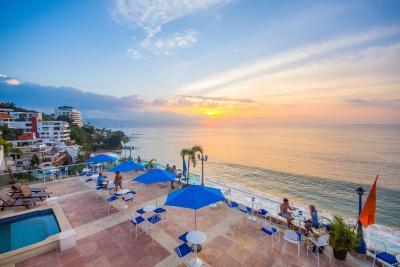 We frequent Puerto Vallarta twice a year and this hotel was by far our worst experience. The staff did their best to accommodate us and help resolve so many negative issues. The place is run down. No TV during our stay. No mini fridge in room. No privacy curtains. No dresser in room. Lock on balcony door not effective. The place is poorly maintained. It is old and it is not being looked after. It is dirty. 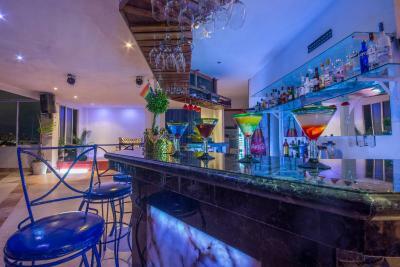 It is noisy with loud music on the rooftop bar from 5PM to 10PM daily so if you want to take a siesta on the upper floors, forget it. The staff did not respond to or apologize even though I complained four time about how dirty my apartment was, including dirty furnishings, despite my paying a premium price for a superior, king sized room. 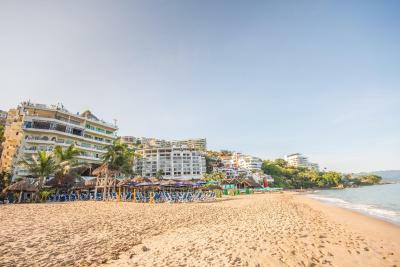 The location is good, with easy access to the town and beaches on foot. We didn't have a phone in our room so we always had to go down to the lobby if we needed something which can be a chore because the elevator is slow, and when you do get it the buttons didn't work most of the time. We had ants all over our nightstands so we had to get that taken care of. Then our toilet didn't work and it took awhile to get them to fix it, we were having to use the public restrooms up at the pool level. Location. Right against a popular area of the beach. Just a walk across the street! 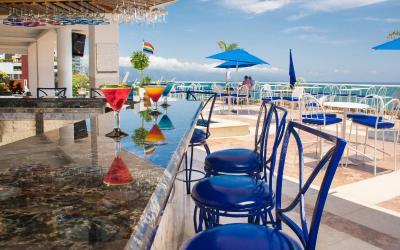 The rooftop bar also offered nice views and there was a fun happy hour with inexpensive drinks. Our balcony was large and spacious with great beach views. Nasty rooms in horrible condition, could not get towels for 3 people ever. No bath mats, hand towels or wash cloths. Could not get coffee delivered for the tiny coffee maker. Elevator usually does not work and if it does you are risking your life to be in it. Horrible, horrible experience. Nothing. Should be renovated, torn down or it may fall down first. The room had shabby furniture. Broken plastic balcony chair. Shower curtain was moldy. Had to request shower drip to be repaired. WiFi was non-existent in room - only available WiFi was in lobby or near a shabby courtyard pool. Music on rooftop bar was too loud for casual conversation. Sheets didn’t fit king bed. Plants in halls were dead. Toilet seat didn’t stay up. No phone in the room to contact desk. No safe in room. Room lighting was miserable. Half eaten fruit on the hall floor. Loud thumping music from nearby beach club made for a miserable experience. Location was great. Place is very rundown. Needs major improvements!!! 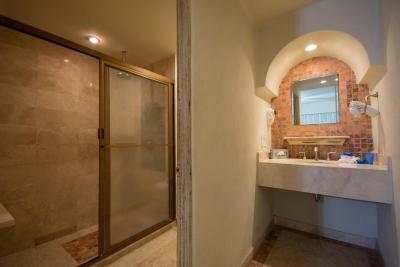 This property is misrepresented in the photos. There were were no towels in the room, the floors were dirty, no glasses, no fridge, no coffee maker or coffee in the hotel. The staff were friendly and tried but it appears there are not enough staff to keep the place clean or maintain the minimal standards required by a hotel this size. We met other guests staying with similar experiences. the shower was nice, warm water. Leaving this place was nice!